The summer season of the Dog Works Radio Show: Mush! You Huskies with stories of the Dog Sledding Legends of yesterday and today continues. On today’s show we talk about my greatest inspiration as a musher. Scotty Allen. In more than one race, however, Allan could look back over his shoulder and see John “Iron Man” Johnson’s long string of Siberians slowly gaining on him. 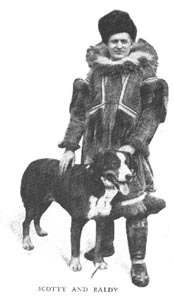 Johnson led a team of culls from Fox Ramsay’s other two imported Siberian Husky teams to a record setting win for him in 1910. The handwriting was on the wall for the mixed-breed freighting teams. Johnson’s Siberians beat Allan’s team by nine hours in 1914, and then Leonhard Seppala and his Siberians wrapped it all up in the final three years of the Sweepstakes.